The holiday season is here! Daylight savings has shorted the afternoons, but it has given us more time to enjoy holiday lights and outdoor activities. There are a number of outdoor movies to enjoy with your honey, plus holiday-themed cooking and cocktail classes. The James Beard Foundation Celebrity Chef Tour Dinner is returning for the 4th year and the Orlando Ballet’s The Nutcracker is a must-see at the Dr. Phillips Center for the Performing Arts. Here are our favorite events for the month of December. Happy Holidays, and be sure to use a ride-sharing service if partaking in any boozy activities! Holiday festival featuring a Holiday Light Show with more than 200,000 lights timed to holiday songs plus snowfall, ice skating rink, ferris wheel, Arctic Glide Ice Slide, and more. FREE Admission; individual ride tickets start at $4 and combo tickets are also available. Brought to life by ice artisans from Harbin, China, this year’s theme is recreated in a colorful frozen showcase, with hand-carved ice sculptures depicting movie scenes throughout the immersive (and very chilly) 9-degree attraction. Back by popular demand, celebrate the holidays with Dickens’ classic ghost tale! The miserly and miserable Ebenezer Scrooge greets each Christmas with a “bah humbug,” until he is visited by the Ghosts of Christmas Past, Present, and Yet to Come. Brunch, booze, DJ spinning the best pop & house of the 80’s 90’s ’00s and today, and more. Enjoy a celebration of community voices – music, dance, spoken word, and poetry. Performances inspired by the art of Nick Cave and Purvis Young will be held in the Rotunda, SunTrust auditorium, and galleries throughout the afternoon. Get that Goodwill sweater, find those tacky holiday pants, and get ready to jingle bell ROCK! Watch as the park comes alive with spectacular holiday displays featuring 200,000 lights and a 60-foot tree decorated with thousands of ornaments and over a mile of garland. Event also features live music, fireworks show, photos with Santa and Mrs. Claus and more. Enjoy a full day of music and holiday festivities culminating in the evening finale performance by the Orlando Philharmonic Orchestra and the Singing Tower carillon. 4th Annual James Beard Foundation Celebrity Chef Tour Dinner featuring an incredible group of guest chefs for an unforgettable multi-course dinner event. The event will feature multiple stations of holiday-themed beers from local breweries including Crooked Can Brewing Company, Rogue Ales, Coppertail Brewing Company, Redlight Redlight, Bowigens, Cask & Larder, Red Cypress, 3 Daughters, Baird Brewing, Hourglass Brewing, and Motorworks Brewing. Enjoy pairings of Pan-Asian bites at each station, while taking in the beautiful backdrop of the restaurant’s award-winning dining room. The Wine Room hosts the 4th Annual Champagne & Cheese Festival, a walk-around event featuring dozens of bubbles and an artisan cheese spread. Will’s A Faire is the biggest outdoor/indoor vendor market in Orlando, with 70+ vendors, live music a la Southern Fried Sunday, craft cocktails, sodas and brews from Will’s Pub & lil Indies, food trucks, and free fun for the entire family. Join New Moon Market’s owner Jennifer Moon-Huggett and Chef Sarah Cahill for a fun-filled evening learning how to eat well! Healthy smoothies, juices, and meals you can make every day, every month, and all year long. Come enjoy your favorite Christmas classics on the lawn the first three Mondays of December! Each evening includes a double feature, a raffle with movie-themed prices, four food trucks, and alcoholic/non-alcoholic beverages available at the bar. The two-hour program begins at 6:15 p.m. Central Park creates the beautiful backdrop for the lighting of nine turn-of-the-century Tiffany windows as the Bach Festival Choir performs in concert on the main stage. Sweet & Savory is Orlando Weekly’s most intimate event to date, featuring the city’s most decadent eateries serving indulgent desserts as well as succulent savories, complimentary cocktails, brews, and entertainment. Enjoy a free outdoor movie at Winter Park’s Central Park in partnership with Enzian Theater. Guests are encouraged to bring blankets, snacks, and other goodies. Movies are typically screened on the second Thursday of each month, though there are exceptions. Inspired by street food classics born in Tokyo, and seasoned with the flavors of the deep South Southern Kitchen, this dinner event is unique to Dr. Phillips. Adventure out of your norm, and experience a dinner combination you never knew you needed-Japanese Street food with true Southern Soul. Jake’s Beer Dinner – Terrapin Beer Co. Taking place only a handful of times each year, the dinner features five expertly prepared courses that the hotel’s award-winning chefs pair with local or regional specialty craft beers. Jake’s Beer Dinner is an adults (ages 21+) only event. Experience the sights and sounds of the season when visiting Downtown for the Holidays. Throughout the entire month of December, downtown Orlando is offering free holiday movies for all to enjoy. Get dressed up in all of your favorite holiday gear from Santa hats to ugly sweaters to anything that helps spread that holiday cheer. Local Chocolatiers will be on hand with their delicious treats, as well as local Artists and Crafters displaying their work. Enjoy live music by incredible bands on outdoor stage throughout the entire weekend. Lakeridge wine, beer, soft drinks and a variety of food will be available for purchase, along with complimentary Winery tours and tasting. Orlando Ballet presents the cherished holiday tradition, The Nutcracker. Let your imagination fly as you join Clara on a spectacular journey through waltzing snowflakes, mischievous mice and dancing confectionary with the iconic Sugar Plum Fairy. The gardens open at 6 and the movie begins at 7:30. Outside food and alcohol are permitted – enjoy responsibly! 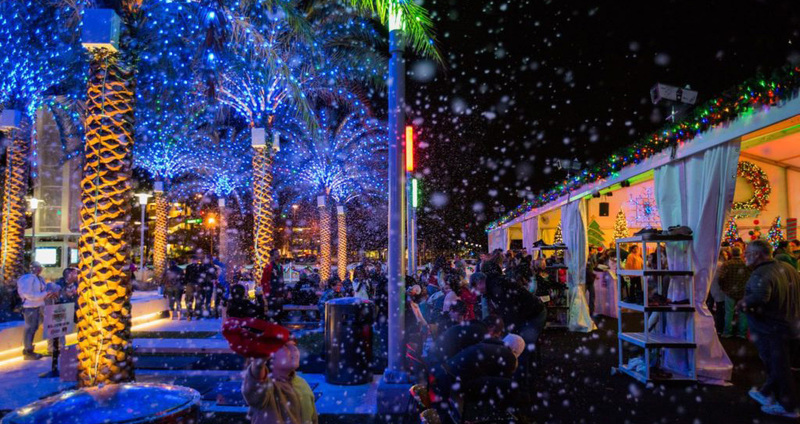 Join in the tradition of Winter Park holiday festivities as Park Avenue is transformed into a winter wonderland, complete with a tree lighting, carolers, and a visit from Santa. Come aboard the 3rd deck rooftop and enjoy a holiday themed cooking class demonstration with Executive Chef Steve Richard. Guests will learn “Risotto the right way”, braising beef short ribs, and holiday bread pudding. Orlando Florida’s latest beer festival presented by What Ales Ya Podcast and Ten10 Brewing Co. featuring close to 20 breweries from outside of Orlando (surrounding cities and out of state) with over 60 rare and new beers to be sampled. Orlando Brewing’s 3rd Annual Holiday Market will feature local art & craft vendors, food from Not Your Mama’s Pancakes, LLC, desserts by Delightful Cakes, and live music performances by David Bathen Violinist and DJ and more. In addition, they will be collecting item donations for the Coalition for the Homeless of Central Florida. Celebrate the end of prohibition back in December 1933. Don’t forget to dress to the nines for a roarin’ good time! Drink specials and $35 FALL prix fixe available. The Lake Nona Holiday Festival will feature one of Central Florida’s only outdoor, open-air skating rinks, live entertainment, occasional snow falls, festive food and drink options, classic holiday movies, and appearances from the big man himself, Santa Claus. The Lake Nona Holiday Festival will be open Thursday-Sunday. Come celebrate the new year – kamayan style! No forks, no spoons. . . just banana leaves topped with mountains of Filipino food and great company. Come hungry! Friendly ramen cooking competition between three local Orlando chefs to benefit their favorite charity. The contestants are Yuhi Fujinaga – Executive Chef Morimoto Asia at Disney Springs, Kevin Kel Phanhvilay – Chef/Owner Sticky Rice Lao Street Food and Travis Cliff – Head Chef Jade New Asian. Six course menu & wine pairing featuring truffles from Italy, France, and United States. Partake in a mixology demonstration class and learn how to make classic holiday cocktials that will wow your guests at your next party. Light bites will be served during class. An interactive, step-by-step course on manual brewing with a Chemex, explain basic coffee terminology and share some insights on Onyx Coffee Lab, the coffee proudly served in every cup at The Glass Knife. Celebrate National Gingerbread House Day in good company with champagne and savory treats while creating your own version of a Gingerbread House. The time has come for Orlando Story Club 2018 winners to storm the stage and share their best personal narratives in hopes of being crowned the best storyteller of the year. All qualifying storytellers are given the opportunity to put their name in a hat, and chosen individuals are selected at random to share their stories for the enjoyment of the local community. The December event theme is “My Favorite Things” and the benefiting organization is ArtReach Orlando. Grab your friends and don your beach wear for this mishmash of Florida fun in a winter wonderland! Dash through the 9-degree ICE! attraction with ice slides and more, before warming up in the Alpine Village with hot chocolate, a live DJ and eight snow tubing lanes. Every 2nd Thursday of each month from 5-8pm, this is the place to be in Seminole County! This street party held in Historic Downtown Sanford (rain or shine) features several food trucks, live music, and a large selection of vendors and artisans selling their goods. November’s AA5 theme is Chili Cook Off. Pick up a glass and map, then stroll the district visiting over 25 businesses offering tastings. This five-course meal will be prepared by Capa Chef Gabriel Massip and Executive Pastry Chef Rabii Saber, along with premium Champagne pairings. A holiday spectacular performed by the CFCArts Community Choir and Symphony Orchestra. Fresh from her iconic portrayal of Sue Sylvester on Glee and her Broadway debut as Miss Hannigan in Annie, Jane will bring her comic skills and musical prowess to the theater stage. She will delight the crowd with poignant and hilarious takes on holiday favorites. Enjoy a day of live blues & jazz during the holiday season! Eat from 15 food trucks, enjoy shopping from vendors for last minute gifts, meet Santa and enjoy our kid-zone and more! Performances by Ramona The Band, The Smokin Torpedoes, The conglomerate and more. Enjoy an exclusive dining experience exploring wine and cuisine from Italy’s top regions. During SNOW FEST, attendees can ice skate, play in REAL snow, learn to Curl, enjoy a snow slide for kids, bounce houses, live DJs, and get their faces painted. Come out for a delicious pairing of craft beers with our house-made gingerbread cookies! Enjoy a flight of gingerbread cookies with special icings paired with a flight of some of your favorite Playalinda beers. A juried art show in the Historic Sanford Welcome Center, and a walking tour of the art venues located in historic downtown Sanford. Based on the 1954 movie starring Bing Crosby, Danny Kaye, Rosemary Clooney and Vera-Ellen, Irving Berlin’s White Christmas tells the story of a song-and-dance team putting on a show in a magical Vermont inn and falling for a stunning sister act in the process. It’s full of dancing, laughter and some of the greatest songs ever written—including “Happy Holiday”, “Sisters”, “The Best Things Happen While You’re Dancing”, “Snow” and the unforgettable title song. Enjoy a five-course beer paired dinner featuring MIA Beer Company beers. Join thousands of visitors who converge in Downtown Orlando for Orlando’s Gallery Hop featuring venues such as CityArts Factory and Redefine Gallery. Glow in the dark, moonlit paddle in clear kayaks through the beautiful Winter Park Chain of Lakes. take a ride through Ivanhoe Village and College Park to take in the great light displays. Ride will be about 6 miles at a casual pace, all bikes welcome! Don’t forget to decorate your bike! Donations are asked to benefit One Heart for Women and Children, to help bring Christmas to those who might not otherwise be able to celebrate. The Island will be open from 7-11pm only to VIP ticket holders! Select beers and wine included along with a delicious small plate selection by Without A Paddle Cafe. Portion of proceeds will be donated to The Audubon Center For Birds Of Prey. A special seven-course prix fixe menu will feature all-inclusive new world and old world wine pairings. On December 27th at Rock Springs we will be honoring Alex by offering our normal tours as scheduled, however, ALL of the proceeds will go directly to a charity of his families choice: ConserveFlorida.org. Enjoy the best pairings of 2018 in Quantum Leap’s annual “best of” class with 5 complete pairings of wine, cheese and Peterbrooke Chocolatier of Winter Park chocolate confections. The Camping World Bowl matches top teams from the Big 12 and Atlantic Coast conferences in late December in Orlando. (hometown heroes), spirited high school marching bands from across the nation and more. Enjoy an open bar, heavy hors d’oeuvres and desserts by Arthur’s Catering, live music in the rotunda, a photo booth, a DJ in the galleries, and a champagne toast as you watch a spectacular firework display at midnight. Enjoy live entertainment, a chef-inspired menu and an unforgettable midnight celebration. Say ‘adiós’ to 2018 with a scrumptious Spanish meal, and ‘hola’ to 2019 with a champagne toast. Plus, enjoy live flamenco dancing all night long. Ring in the New Year with hand crafted cocktails, late night small bites, live entertainment and our spectacular fireworks display over the Grande Lake. Ages 21+ only, ID required. Ring in 2019 at Wreckers Sports Bar’s New Year’s Eve Bash featuring a live DJ, midnight balloon drop and party favors! Enjoy a buffet meal, including salad, charcuterie and carving stations, plus specialty dessert selections as you view celebrations from around the world on 37-foot TV screens. Celebrate The Edison’s 1 Year Anniversary with a dazzling gala on New Year’s Eve showcasing our crave-worthy food, exceptional cocktails and world class entertainment. The Edison’s doors will open at 7:30 p.m., allowing guests ample time to eat, drink and be merry, right up through a special midnight toast to ring in 2019. Guests must be 21 and up. New Year’s Eve party featuring buffet, DJ & dancing, reserved table all night, champagne toast at midnight, party favors, optional drink package add-ons and more. Looking for more NYE happenings? Check out our 2019 NYE Event Preview!